Tesla’s stock price surged to new highs last week when Elon Musk announced his intent to take the company private. But almost a week later, the stock is trading below its pre-tweet prices, signalling that investors aren’t convinced a deal will happen. 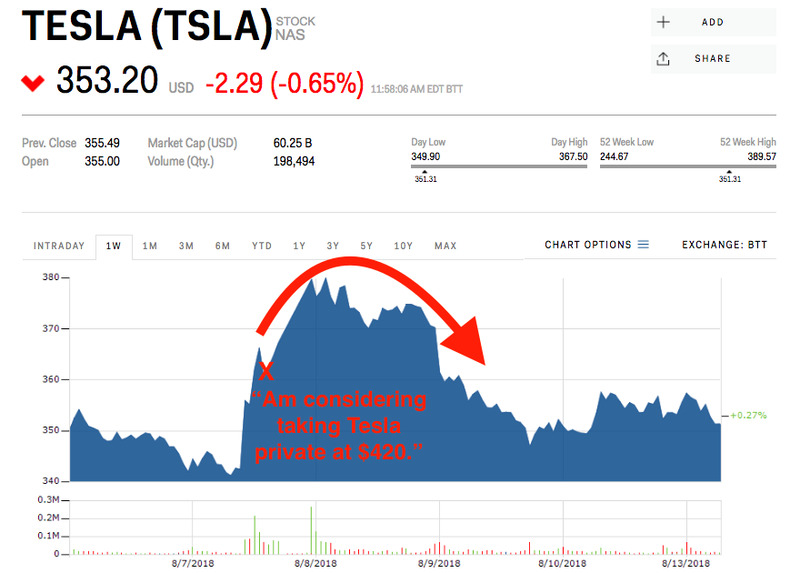 It took less than 48 hours for the stock market to decide it didn’t believe in Elon Musk’s plan of a go-private deal for Tesla. 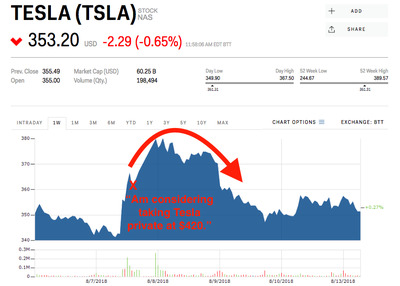 When the billionaire cryptically tweeted that he was “considering taking Tesla private at $US420. Funding secured” at 12:48 pm eastern time on Tuesday, the stock was trading just above $US361. By that afternoon, shares had surged more than 10% to a near record-high of $US379.57. Over the course of the week, however, the stock fluttered downward amid reports of an investigation by the US’ top stock regulator, the Securities and Exchange Commission, and interviews with experts who told Business Insider his tweet could have been illegal. 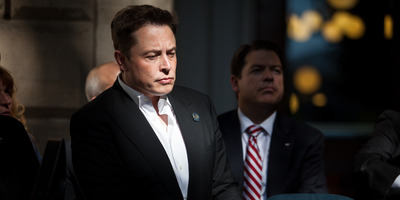 Tesla’s stock continued to stall Monday and was hovering near $US350 per share, a 17% discount to the $US420 go-private price Musk said was “fully secured.” If stock investors were fully confident in the CEO’s ability to get a deal done at that price, shares would theoretically be trading at a much smaller discount. In other words, traders are telling Musk, as best they can, that they’re not convinced. Wall Street analysts have been puzzled by the $US420 price set by Musk. The price is likely too expensive to solicit new private investors and not high enough for current holders who may be seeking higher returns, Pierre Ferragu of New Street Research told clients Monday. “The stock will not look indecently cheap to private investors. We understand many would buy in the $US420 region, but struggle to believe they would pay materially more,” Pierre Ferragu of New Street Research told clients Monday. Rita McGrath, a professor at Columbia Business School, made a similar point when speaking to Business Insider last week. Alex Morrell and Joe Ciolli assisted with reporting.